Would YOU still be working at 80? Barbara Taylor Bradford received her highly-regarded OBE (Order of the British Empire) in 2007. You’re 80, have good health, a wonderful husband, a fabulous home and oodles of money. Why, for goodness sakes, are you still working from morning to night? Because you’re renowned author Barbara Taylor Bradford, that’s why! What drives you, at this point, to keep writing? But what would I do? I have no children, so therefore, no grandchildren. My husband goes to an office every day. He’s a very busy man. He makes most of the TV movies and the mini series of my books. He’s just planning a couple at the moment, which is why he’s in London now. I went to work at 15 1/2. Do you think I can sit here staring at the TV all day long or going out with women who like to lunch and then go shopping? I’m easily bored. When I finish the book I’m writing now, which will be at the end of July, Robert and I will go away for a couple of weeks. And then we’ll come to New York and WHAT WILL I DO? I can’t just sit. I don’t want to do what others want to do. I want to write books. Getting engaged in a complex story about people who don’t exist, and I create lives. Someone said to me recently, ‘oh, but you lead a very lonely life during the day.’ And I said, ‘No, it’s not lonely.’ I have a solitary occupation, or profession, if you like. But it’s not lonely. I’ve got all these people who I invent and they become real. They have lives I create and I sit there telling all these lies. It’s a great challenge to weave a story and create drama. And there’s another thing. I actually really love being a best-selling novelist. Creating people who don’t exist and making them feel real to the reader. Creating something from nothing, because that’s what it is. A novel is a monumental lie that has to have the absolute ring of truth if it’s going to be successful. And the lie, of course, is the story and the lives I invent and the dramas and the problems. And the underlying support that gives it authenticity is that I include a lot of real events and things that have happened in the world at different times. I use a lot of history. I enjoy all of the razzmatazz that happens when a book comes out, especially in England. I go over to London where I promote the book and there are book and author events. People come to lunch, or a tea, or a coffee morning, and I give a talk. They buy a book. I sign the book. I love all that. My publisher in London always gives me a party. I’m very recognizable because I’m always in the paper. I’ve become a little bit of an icon, I suppose, after 35 years as a novelist. I did 58 interviews and 4 events on the last trip. So I love all the excitement, the parties and the fuss. That’s the bit of glamour that you get, when the book comes out. The rest of it is just the hard slog. Of course, you always love your first published novel. I started about 4 or 5 novels that I never finished. I put them away and I didn’t like them until I had the idea for A Woman Of Substance. It’s sold 35 million copies worldwide and is still selling everywhere. It was a six-hour mini series and it spawned two other books, Hold the Dream and To Be The Best. You always love your first novel, I suppose, but the book launched my career as a novelist. Why are your books so popular? I think the main thing is that I write about women very sympathetically so the reader has an empathetic feeling towards my protagonists. But I write about women who go out there and do it, who are women warriors, who conquer the world, who are women of substance, who go from being nothing to something important. And I don’t necessarily mean in work. I can write a novel about a woman who survives tragedy, like in Everything to Gain, the protagonist’s husband and children are killed in a carjacking and how she carries on afterwards and what happens to her and what she becomes. It isn’t always about a woman making money. That isn’t always the triumph. It’s also about overcoming adversity as well as making go of a career. The women who I write about have become role models to other women, to the readers. Especially A Women of Substance, after reading it women will often say: ‘Oh, I decided to go out and go into the real estate business or I decided to sell my designs.’ Whole careers and lives have been built on some of that book. And I wasn’t sending a message. I just wanted to tell a good story. What’s the best thing, Barbara, about having so much money? I think we all want to have money. We have to pay our bills. I want to explain an attitude I have first. People say, ‘I think I can be a writer. I want to be rich and famous, just like you.’ I always say those are the wrong motivations. You won’t be if that’s what’s motivating you. You have to want to do the work and you have to want the challenge of doing your best work. Which is what motivates me. Money lets you plan for your old age. I’m not old. I’m 49 actually, in spirit. And I don’t look 80 nor do I feel it. I was up at 4:30 this morning, dealing with my London editor. The best thing is that it gives you independence if you’re a woman. It’s nice to make money, if you’re working. I give to charity and do a little work for charities. I am involved with Literacy Partners; Police Athletic League, which helps under-privileged children; Bob and I were one of the founding couples of the New York Pops and still support the orchestra; I am also on the board of the Authors Guild Foundation and give to that charity, too, and The St. George’s Society of New York, which is one of the oldest charities in the city. I also support charities in the UK, including one for missing and abducted children, called PACT. Money gives you a certain amount of independence and security. Mind you, I’m married to a very successful man. We were never starving in the streets. It’s always nice to give a nice present to people you care about, to help them out if they have problems. It’s a nice feeling to be able to manage a lot of things without worrying. When I’m writing a book, I’m writing every day, seven days a week. When Bob is here, I get up at 5:30 or 6 and turn on the coffeepot and I get out his orange juice. And I have a coffee and a piece of toast and I come to my desk and I look it what I’ve written the day before because I try to always have some pages to edit because it pulls you back into the book. I get him up at around 7:30 and I boil water and I stand and look at the clock as the eggs boil for 4 minutes. Then he gets his two boiled eggs and a kiss and then I leave him and get dressed. I’m in a dressing gown till then. I glance at the British papers, put them away (he’s got the American papers) and then I go to work. I start writing the minute I’ve given him his breakfast so I know I won’t be disturbed. I go and put on pants and a tee shirt and I work until 12 o’clock. I do force myself to get up and walk around a little bit because one should. You get very stiff sitting. I stay at the desk until around 4 or 5 pm. I have a bit of lunch, a tomato salad with some endive or a piece of smoked salmon and a piece of toast. I eat very light at lunch. If we’re going out, I’ll probably have a rest for an hour on the sofa in my office. I actually do fall asleep. I am a great believer in naps, borrowing that from Winston Churchill, who always believed in a nap after lunch. I do not work at night. I’ve always been a daytime worker. Do you go out a lot or do you like to cook at home? We do go out several nights a week. We like to go to the theatre and the movies, but we see most of the movies at home. I love to cook because I don’t have to think. I like to make a lamb stew or chicken in the pot. Do you use a computer to write? When I look at the screen, I freeze. I lose my creativity. The screen seems to demand that I write instantly and I can’t do that. I use a very modern IBM Personal Wheelwriter 2, by LexMark. Or I write in pen and then it gets faxed to a typing agency and they put it on a disk. I use a computer to do the research, but I find I can’t write. I do a lot of research myself. I do a lot of handwriting on a yellow pad and then I type that up and edit the page. People who are very into computers kind of get hostile with me, and they say, ‘You don’t use a COMPUTER!!! Why?’ My answer is that I do it the easiest way for me and if it ain’t broke, don’t fix it. They must be threatened by something else. What’s the best thing about being 80? The worst? The best things about being 80 are the wisdom and patience that I’ve acquired from my experiences. There’s nothing I don’t like about it. I have lots of younger friends, in their 40s, 50, 60s and 70s, who are up on everything. Many 80 year olds want to lie in the sun and relax, but I have a typical English complexion so I’m not interested in doing that. No, I haven’t. Oh, well that’s not true. A number of years ago, and I’m going back 30 years, I had my eyes done. If you touch your eyelid, beneath your hard brow, I had rather heavy lids so I had a lot of skin removed and I could see better and, of course, I look better because I had too much skin on my eyelid. I’ve had fillers. I’ve always had a frown. So I have Botox on the forehead and on the bridge of my nose, which is very narrow. I’ve had Juvederm, on the lines that come down from the nostrils to the lips. I do use a lot of creams. Evelyn Lauder, who died of cancer about two years ago, was a friend of mine and she told me to use Night Repair, in a brown bottle, and Re-Nutriv. And there are a number of their creams that I put on every night before I go to bed. My father, who died at 81, looked 60. I’m lucky in that way. I do use a lot of creams and Botox and filler. I have to have a book in every July. It takes about nine months to write. Do you go to many doctors? Take medications? I might take a Tylenol occasionally, if I get a headache. I take Vitamin D and I take some pills for bone density. I am a great believer in Vitamin D. It’s very good for the legs and for walking. I still wear high heels. They were 3-inches, but then I could only go in and out of a car with them. But I do wear 2-inch heels and a lot of wedges, which are comfortable. My foot doctor in New York said ‘no woman should wear flat shoes,’ after I got tendonitis from wearing flats. I eat carefully and I don’t want to put on weight. I’m not thin, by any means. I’m 5’6” and I’ve got flesh on me because I don’t like bone-thin women. I don’t eat a lot of red meat. I eat fish and chicken. I take care of myself and I walk a lot. I’m lucky that I’ve got good health, as I knock on wood. Do you go to London a great deal? Last year, we went to London from September through December, but we don’t keep a home there. We live at The Dorchester Hotel and have for 25 years. It’s much easier; we always have the same suite there. I read that you’re selling your New York apartment. We live in the fifties. We put it up for sale because it’s just too big. It’s 14 rooms. 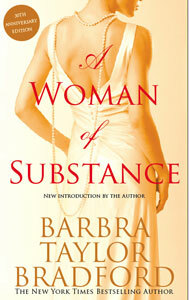 Enjoyed reading about Barbara Taylor Bradford”s personal life. Barbara you are a good role model for women .. Keep writing and enjoying your life with Robert you are a lovely couple.. Terrific interview! And what a woman! I really enjoyed this interview with Barbara Taylor Bradford. I just watched A Woman of Substance last week. Still one of my favorites. Thank you Faye! I enjoyed interviewing her as well. She’s quite a powerhouse.